George Clooney stars in an epic Disney adventure. Join former boy-genius Frank (Clooney), optimistic teen Casey (Britt Robertson), mysterious Athena (Raffey Cassidy) and brilliant David Nix (Hugh Laurie) in a magical world where anything is possible. I fully regret not seeing this in the theaters, the reviews weren’t all that hot for it and I figured it was going to be yet another Disneyland ride tie-in, and while there’s some obvious product tie ins, they’re not the primary focus of the scene, unlike what you see in movies like Transformers. Let’s put it this way: if you enjoyed The Rocketeer, The Incredibles or The Iron Giant, this is a film for you. 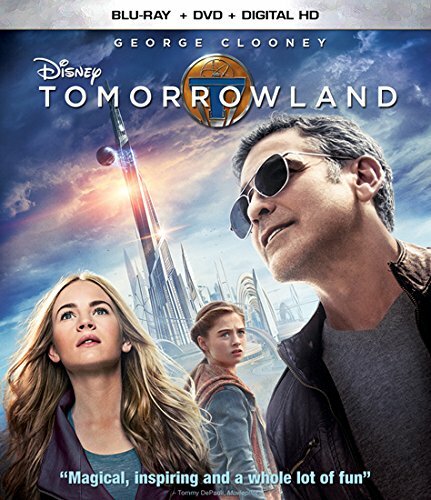 That same heart is there and is just as great as Bird’s other films, I really enjoyed Tomorrowland.